Get the details over at Civil War News, along with a summary of what’s been happening over the past couple of months. To celebrate Halloween, I direct your attention to the creepiest historical attraction in the known world—the John Brown Wax Museum in Harpers Ferry. My first visit was at the age of seven or eight, when my family stopped at the Ferry on a trip to Maryland and D.C. This was well before I had any real interest in history, so most of what I saw on that trip went far over my head. At the National Museum of American History, the one item that impressed me the most was an original Kermit the Frog puppet, if that tells you anything. In fact, for years afterward, I remembered hardly anything from Harpers Ferry. But the John Brown Wax Museum made an impression. Oh, yes indeed. It scared the living hock out of me. It was in one of the town’s older buildings. The exhibits consisted of a series of tableaux with life-size sets and wax figures set up behind glass windows, each scene depicting an episode from Brown’s life. So basically I had to wander around a series of dark corridors populated by wax dummies wielding guns and pikes, posed in various states of distress with anguished expressions on their faces. To make matters even worse, some of the scenes had switches that made the figures move. One scene showed the mortal wounding of Hayward Shepherd, the black railroad employee killed in the raid; Shepherd was lying on the floor of the set, wearing a bright red shirt. A push of a button made his torso heave to simulate heavy breathing. In and out, in and out, in and out. By the time we got to the last scene, which depicted Brown at the gallows (nothing like a public execution to wrap up an educational museum visit), I had my hands over my face, with just a few fingers cracked to enable me to see where I was going. Then it was off to Antietam, where I was treated to stories of corpses lying in rows and creeks running red with gore. I slept with the light on for about two decades after that. Summer before last, I went back to Antietam and Harpers Ferry with my mom. It was my first time setting foot in either place since that original horror-laden vacation. I was shocked that I remembered so little from the first trip. Both Harpers and Antietam are stunningly beautiful, two of the most picturesque, well-preserved, and professionally-interpreted parks in the whole NPS system. And the John Brown Wax Museum was still in operation after all those years. The admission was a little steep, but Mom and I went in anyway, for old time’s sake. One of the most complicated and controversial battles of the Revolutionary War took place at Monmouth Court House, NJ on June 28, 1778. The war had just changed fundamentally, since France’s entry as a belligerent forced the British to contract their commitment in the colonies. This meant, among other things, abandoning Philadelphia, which they had captured the previous autumn. The British march away from the rebel capital presented Washington with an opportunity to inflict some damage on his enemy’s force as it crossed New Jersey. The ensuing engagement demonstrated that the Continental Army, so often defeated in the war’s previous two years, had become a formidable fighting machine. 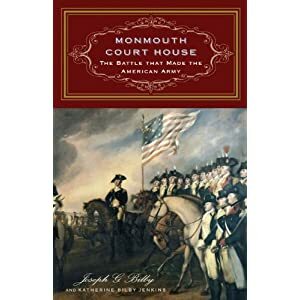 This battle and the events surrounding it are the subject of Monmouth Court House: The Battle that Made the American Army, by Joseph G. Bilby and Katherine Bilby Jenkins, released this summer by Westholme Publishing. It is a book much wider ins cope than its title suggests. The Revolution in New Jersey was a civil war, and the course of that civil war depended greatly on the fortunes of the regular armies. The Tory ascendancy in of 1776 in New Jersey proved relatively brief. British and Hessian rapacity alienated many civilians, Washington’s enterprising attacks at Trenton and Princeton demonstrated that his army was not subdued, and an active local militia proved that while New Jersey was occupied, it remained unpacified. Fighting in the state continued through 1777, as both sides skirmished and foraged throughout the countryside. The residents of Monmouth County experienced the effects of this fighting firsthand, both before and after the climactic battle that erupted among their homes in the summer of 1778. They also participated, often as militia or members of impromptu bands that coalesced in response to local military, social, or religious conditions. Organized Loyalists benefited from the presence of British regulars, attacking Whigs and confiscating their goods, but when control of New Jersey shifted to the Patriots, the tables were turned and Loyalists suffered accordingly. Some Tories joined armed bands of outliers, like the one led by an ex-slave that terrorized local Whigs from a base at Sandy Hook. Legal and extralegal Patriot groups targeted these Tories and those suspected of sympathizing with them, resulting in a kind of see-saw partisan conflict in which each side persecuted the other while operating in the shadow of whichever occupying force was most prominent at that particular time. Bilby and Jenkins use local records and correspondence to illuminate the inner workings of this struggle within Monmouth County. The fortunes of the regular armies shifted back and forth, also. By the summer of 1778 the Continental Army was a matured fighting force. While the British had occupied Philadelphia, the Americans spent their winter at Valley Forge training under the tutelage of the colorful Prussian drillmaster Baron von Steuben. The British abandonment of Philadelphia, supervised by Sir Henry Clinton, was a necessary consequence of France’s entry into the war, but it meant marching across dusty roads in intense heat, exposed to an enemy more proficient at making battle than it had ever been. Some of Washington’s subordinates urged their commander to use the British withdrawal march as an opportunity to attack. One who disagreed was General Charles Lee, a onetime veteran of the British Army who was also a critic of his commander and until recently a prisoner of war; while in captivity his behavior was sufficiently questionable as to bring his loyalty to the American cause into doubt. Lee warned that the army was not prepared for an all-out engagement, and recommended the use of small-scale harassment. Washington determined to divide his force and send a portion of it against the British flank and rear, seeking an opportunity to harass the enemy’s army and perhaps inflict serious damage. Once it became clear that this force would be considerable in size, Lee insisted that his seniority entitled him to command it. Washington relented, allowing Lee to take charge of a detachment faced with a task that he had vocally opposed. According to Bilby and Jenkins, Lee’s unfamiliarity with the troops under his command and with the terrain over which he would have to fight caused much of the confusion that followed. When the two armies caught up with each other along the fields, marshes, and ravines near Monmouth Court House on June 28, the British counter-attacked. Faced with ever-increasing numbers of British troops, American units began to withdraw from the field, and shortly thereafter Lee himself ordered a general withdrawal and tried to establish a defensive position to the rear. Washington arrived on the field surprised to find his troops retreating; encountering a confused and flustered Lee, he failed to secure a satisfactory answer as to why the withdrawal was taking place. Washington himself then took command of the army and oversaw the establishment of new defensive positions along elevated ground, which the British found difficult to crack. After a two-hour artillery duel and a number of localized American attacks, the British completed their withdrawal from the battlefield, marching away to Sandy Hook for embarkation to New York that evening. The Americans had demonstrated their ability to stand toe-to-toe with British regulars in formal combat. Still, the initial American withdrawal at Monmouth Court House ended the Revolutionary career of Charles Lee. The combative general insisted on a court-martial to clear his name and dashed off a series of insulting messages to Washington, which did little to help his cause. The American commander obliged Lee’s wish for an inquiry, which found Lee guilty of disobedience for failure to attack the British, conducting an improper retreat, and disrespect to his commander. Suspended from command for a year, Lee continued his crusade to vindicate his reputation, eventually getting himself removed from the army altogether. Bilby and Jenkins find Lee largely responsible for his own misfortunes. While the court-martial leveled accusations against Lee that were partly untrue (Washington had not ordered him to bring on a general engagement, despite the accusations of some of Lee’s enemies), and while his conduct of the defense following the confused retreat was admirable, the initial American withdrawal itself was, they argue, largely the result of Lee’s own ill-preparedness and his poor initiation of the battle. Likewise, the collapse of his military career was essentially his own fault, attributable to his belligerent behavior after the battle. If Lee’s reputation suffered as a result of Monmouth, though, the Continental Army had vindicated itself after the embarrassing defeats of 1776 and 1777 by facing the British in a pitched battle. Over the next century, as Americans turned to the Revolution as a symbol of national unity and spirit, the battle and the field found their own places in American memory. The most prominent figure in the memory of Monmouth was (and remains) Molly Pitcher, a campfollower who supposedly helped man one of the artillery pieces. Bilby and Jenkins find that the Molly Pitcher legend, while embellished over time, likely has a basis in fact; it appears in some later participant accounts, and a likely candidate can be found in surviving records and recollections. The book concludes with a description of efforts to commemorate and preserve the battlefield, which is now a state park. If all this sounds like more than a discussion of a battle, it is. The authors’ intention is to “tell the story of the Battle of Monmouth Court House in a holistic manner” (x). As such, much of the book is more concerned with the battle’s context than with the actual clash near Monmouth, delving into the course of the war in the Mid-Atlantic, its effects on the community, the organization and composition of the opposing armies, and eighteenth-century weapons and tactics. Much of this background material will already be familiar to students of the Revolution, but it does place the battle itself in a larger perspective. As one of the most complicated and controversial engagements of the war, Monmouth seems ripe for the sort of painstaking critique of command decisions that characterize many battle studies, and some readers will probably find the authors’ reluctance to engage in such minute dissection frustrating. Still, this is a useful and enlightening account, one that clearly presents the story of Monmouth and puts that story within its proper place. It will be of interest to any reader interested in the Revolution or American military history. One of the guys behind 24, the star of 300, and Starz are developing a miniseries about Allan Pinkerton, including his Civil War activities. The Baltimore Plot will be a major story point, according to this article, which refers to the foiled assassination attempt as a “little-known episode.” Little-known compared to what? D-Day? The book’s publisher, Five Ponds Press, based in Weston, Conn., sent a Post reporter three of the links Masoff found on the Internet. Each referred to work by Sons of the Confederate Veterans or others who contend that the fight over slavery was not the main cause of the Civil War. Where would black Confederates be without Google? Masoff is also the author of Oh Yikes! : History’s Grossest Moments. I wonder if this one made her list. Steven Anderson is pastor of a small independent church in Arizona. He’s achieved a kind of online celebrity for his advocacy of proper posture while urinating, his explanation of first-century Middle Eastern pants-wearing, and his desire that President Obama would die of brain cancer. Now Anderson has taken up one of my own pet peeves, the lack of history-related programming on The History Channel. I’d assumed it was just a ratings thing, but evidently there is a far more sinister explanation. They’re brainwashing us. And Ted Turner, a noted minion of Satan, is somehow mixed up in it. So I’ve started watching the first season of Ax Men backwards, and sure enough, I distinctly heard a voice telling me to read Origin of Species and then go stomp a puppy to death. I’ve got a request for Rev. Anderson, on behalf of the rest of us Baptists: Could you either find another denomination or stop posting your sermons to YouTube? Thanks. …have new books out on the American Revolution, and they’re completely different. Bernard Cornwell’s latest is The Fort, his second novel set during the War for Independence. It’s about the Penobscot Expedition, of all things. I’ve never read Cornwell, but I find it intriguing that he’d focus on an obscure subject like this. Second, Ron Chernow has tackled the formidable job of a one-volume life of Washington. It’ll be interesting to see what place this bio finds on the shelf of Washington books. There are quite a few substantial, fairly recent, and still-popular one-volume lives of Washington out there—Willard Sterne Randall‘s is still in a lot of stores, and so is the acclaimed abridgment of James Thomas Flexner‘s work. Oxford brought out a new printing of John Ferling’s The First of Men earlier this year, too. Of course, Chernow’s got a built-in readership from his life of Hamilton, which was very well received, so that momentum may bump this book to the top of the stack of Washington bios as far as most readers of the next decade or so will be concerned. We’ll see what happens.